Need for Speed World has recently surpassed the 5 Million user mark. That’s great considering that the game only launched last summer. NFS World was created from the streets of NFS: Most Wanted and NFS: Carbon seamlessly merged together and there is more road planned to be released in the next year. That’s incredible considering that there is already over 150 miles of streets available now. NFS World used a Free to Play model using Cash for Boost for micro-transactions. You can buy or rent special cars, performance parts, visual upgrades, and power-ups with Boost. For in-game cash you can get just about everything except for a few cars, upgrades, and power-ups. Getting to the max level of 50 without using Boost isn’t often done due to the temptation of going just a little faster is so great. The free version also only lets you have 3 cars at a time, also another reason to use Boost to buy more car slots in you garage. There are several different modes for driving available. You can just go Racing with up to 7 other drivers. Another option is Team Escape, where players team up to complete the race and avoid the cops. Speaking of cops, you can get into cop chases if you happen to into a cop in free roam. The newest feature is a Treasure Hunt mode, where you try to find 15 gems within a certain area of the map. 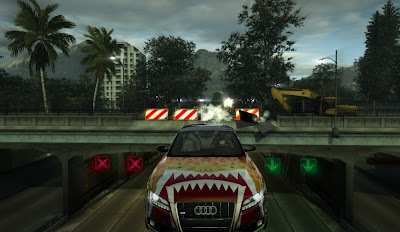 In free roam, you can drive with other players in one of the 40 cars available around the city doing whatever you like. There is even a built-in voice chat feature for up to 8 players at once. One example is an unplanned “Drag Strip” located at the bottom of the map on long flat bridge. Other people like to drift around the grass in one of two stadiums. Whatever your driving taste, NFS World can definitely satisfy your Need for Speed!